‘P2P Income Partners‘ is a new investment fund by Symfonie Capital that will invest capital in p2p loans. The founder, Michael Sonenshine, an ex-investment banker, told P2P-Banking.com that he plans the first tranche to be 25 million Euro. He says: “Initially we will invest in loans issued by sites such as Prosper, Lending club, Funding Circle, Zopa, Isepankur and we will add fonds to the mix as we see fit. The P2P market is not only web-based. There are opportunities to make direct loan across Europe. The key to success is spreading the risk and doing careful due diligence.”. The fund is open to qualified investors. Minimum investment is stated as 100,000 US$. 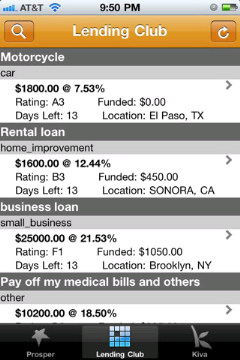 I just saw the first iPhone App that is to support lenders in using p2p lending services. It aims to help them keeping up to date with the latest listings at Prosper, Lending Club and Kiva. The features of this app are rather basic, but with the number of people lending at p2p services there could be a market for a sophisticated app that really helps lenders select loans while on the move. Update: There are in fact two other free apps to browse Kiva loan listings. P2P Lending site Prosper.com changed its business model today. Prosper is still lagging far behind competitor Lendingclub in monthly loan volume funded. While Prosper’s new loan funding process resembles the one of Lending Club more after Prosper did away with the auction it remains to be seen if it will help Prosper to regain market share. The main problem of Prosper was not the auctions, but high default rates leading to lender churn. Prosper.com adds 1 and 5 year loan terms. So far only 3 year loans were available on the p2p lending platform. A Bloomberg article reports that Prosper seeks to be regulated like a bank in order to avoid the jurisdiction of the SEC. Prosper Marketplace Inc., has successfully closed a the new funding round, which it announced two weeks ago. Prosper receives 14.7 million US$ from new investors Tomorrow Ventures and CompuCredit Holdings and existing investors Accel Partners, Benchmark Capital, DAG Ventures, Meritech Capital Partners, Omidyar Network, QED Investors and Volition Capital. TomorrowVentures is the investment vehicle for Google CEO Eric Schmidt. 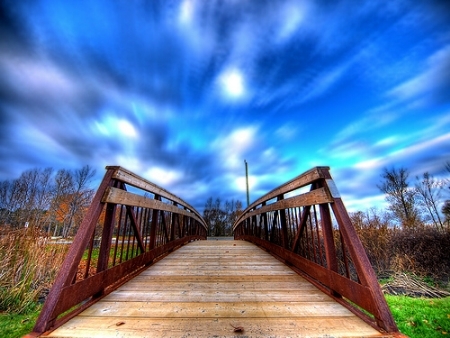 Peer to Peer lending service Prosper is raising it’s fourth funding round. The company announced it is raising between 13.3 and 15.8 million US$. Prosper expects the deal to be closed by April 15th and says a LOI has been signed with new and existing investors. For Debate: Can Data from Social Networks be Used to Reduce Risks in P2P Lending? P2P Lending is mostly anonymous and loans are unsecured. To make the risks of lending to a stranger acceptable for lenders, p2p lending services had to provide models for the lenders to judge the dimension of the risk of not getting paid back. The initial estimation of the risk-level could not come from the platform itself as it had no track record and could not build a model that “calculated” the level of risk involved for the lender. The consistent consequence was that nearly all p2p lenders relied on established third party providers for credit history data and credit scores. Prosper for example showed Experian data on default levels to be expected depending on credit grade. Over the time it became obvious that the actual default levels at Prosper were much higher than the expected default levels based on Experian data. We don’t actually need to argue here what led to this (be it financial development of the economy, be it that p2p lending attracted bad risks, be it a poor validation process), but the result was that since defaults were much higher than expected, lender ROIs were much lower than expected at the time of the investment. And this is not Prosper specific. Several other p2p lending services show clear signs that default levels will (or have) surpassed the initially published percentages of defaults to be expected based on external data. Boober failed due to default levels, on Smava levels are higher than the Schufa percentages fore-casted, same is likely for Auxmoney defaults which will be higher then Schufa and Arvato Infoscore data suggested. The one exception from the rule is Zopa UK, which successfully manages to keep defaults low, as CEO Giles Andrews rightly points out.